As we wrap up 2017 and head into the New Year, we want to thank everyone who has participated in Insect Science Museum events and programs in in the past 12 months. In 2018, Insect Sciences Museum will collaborate with Kids Growing Strong (KGS), a statewide organization, weve designed a local educational program for teens, Taking Wing -- a program designed to involve teens more directly in pollinator habitat stewardship and advocacy. Your tax-deductible donation to ISMC, made through KGS, online at https://tinyurl.com/yaa75qcy or by check will help us to engage the citizen scientists of the future in an exploration of parks and other open space in a way that increases science knowledge and environmental leadership. 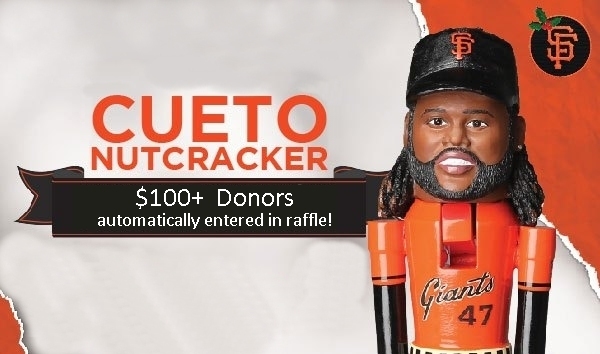 As an added incentive-- every donation of $100 or more will enter you in a drawing for a $100 will enter for a Limited Edition SF Giants Johnny Cueto Nutcracker! As a community - and as a country - we can agree that much effort will be required to ensure that next generation minds and livelihoods are secure. Youth poised to take wing in the near future are meeting headwinds which only decades ago were inconceivable. Cynicism, corruption and misinformation flood the national ecosystem but strong efforts made at a local level can reestablish personal well being and trust in the scientific methodology of trusted local institutions - if addressed soon. Please support us today with a donation through Kids Growing Strong-- note Taking Wing in your donation. Does your employer match charitable giving? Google, Salesforce, HP, Disney/Pixar, Apple, Chevron, Starbucks, Pacific Gas & Electric, Levi Strauss & Co, Gap Corporation, VISA, Bank of America, Genentech/Roche, Verizon, Soros Fund Management, BP (British Petroleum), State Street Corporation, ExxonMobil, CarMax, Johnson & Johnson, Boeing, Microsoft, The Home Depot, JP Morgan, Merck, State Farm, General Electric and MORE DO! And make sure you apply to have your “Taking Wing donation” matched.